St. Faustina Kowalska was born Helenka Kowalska, in Poland. She was the third of ten children, her father a carpenter and a peasant, and her family was poor, but very religious. She first felt a calling to religious life while attending Exposition of the Blessed Sacrament, at age seven. She wanted to enter the convent after finishing school, but her parents would not give permission. She went to work, and helped to support the family. In 1924, at the age of 19, Faustina and her sister Natalia went to a dance. While at that dance, Faustina had a vision of a suffering Jesus, and rushed away to the church, where she was told by Jesus to leave for Warsaw immediately, and join a convent. She got the permission of her parents; she left the next morning for Warsaw. Upon arriving Warsaw, she entered the first church she saw, St. James Church and attended Mass. She asked the Priest, Fr. Dabrowski, and he recommended her staying with a local lady that was trustworthy, until she found a convent. After several weeks, the Mother Superior at the convent of the Sisters of Our lady of Mercy gave her a chance, provided she could pay for her habit. Faustina knew nothing about this convent, except she was led there. She decided to work as a housemaid for one year to save up money, making deposits at the convent through the year and was then accepted at that Convent at the age of 20. She received her habit and took the name “Maria Faustina” of the Blessed Sacrament. The name Faustina means “Fortunate or Blessed One”. She took her first vows as a nun in April 1928. She was sent to the convent in Lithuania as a cook for one year. She was then transferred to the convent in Plock, Poland for close to two years. In the autum of that year, the first signs of her illness appeared and she was sent to rest for several months in a nearby farm owned by her religious order. After recovering, she returned to the convent. On Sunday, February 22, 1931, while she was in her cell in Plock, Jesus appeared to her as the “King of Divine Mercy” wearing a white garment, with rays of white and red light emanating from near his heart. In her diary, she wrote that Jesus told her, “Paint an image according to the pattern you see, with the signature; ‘Jesus, I trust in You’. I desire that this image be venerated, first in your chapel, and then throughout the world. I promise that the soul that will venerate this image will not perish”. Not knowing how to paint, Faustina approached some other nuns at her convent in Plock for help, but received no assistance. Three years later, after her assignment, the first artistic rendering of the image was performed under her direction. In that same vision of Jesus, he told Faustina that he wanted the Divine Mercy image to be “solemnly blessed on the first Sunday after Easter; that Sunday is to be the Feast of Mercy”. In November 1932, Faustina returned to Warsaw to prepare to take her final vows as a Nun. On the first day of May, 1933, she took her final vows. She became a Sister of Our Lady of Mercy. In the Summer of 1936, Fr. Sopocko wrote the first brochure on the Divine Mercy devotion and Archbishop Jalbrzykowski provided his imprimatur for it. The brochure carried the Divine Mercy image on the cover. Later that year in 1936, Faustina became ill, speculated to be tuberculosis. She was moved to the sanatorium in Pradnik, Krakow. She continued to spend much time in prayer, reciting the chaplet and praying for the conversion of sinners. The last two years of her life were spent praying, and keeping up with her diary. On March 23, 1937, Faustina wrote in her diary that she had a vision that the Feast of Divine Mercy would be celebrated in her local chapel, and it would be attended by large crowds, and that same celebration would be held in Rome attended by the Pope. In July 1937, the first holy cards with the Divine Mercy image were printed and in August Fr. Sopocko asked Faustina to write instructions for the Novena of Divine Mercy, which she received from Jesus on Good Friday of 1937. Promoting the messages of Divine Mercy continued throughout the year. As her health continued to decline, her visions intensified, and she was said to be looking forward to an end to her life. In April of 1938, she was sent to rest in the sanatorium in Pradnick, which would end up to be her final stay there. By June, she was so ill, she could no longer write. In September, Fr. Sopocko visited her and she was very ill, but in ecstasy as she was praying. Finaly in a few weeks, she was sent back home to Krakow to await her death. Fr. Sopoko visited her at the convent for a last time on September 26, 1938. On October 5th, 1938 Faustina made her final confession and died in Krakow, 13 years after entering into the Convent. She was buried on October 7th, and now rests at the Basilica of Divine Mercy, in Krakow, Poland. The formal beatification of St. Faustina involved the case of Maureen Digan of Massachusetts. In March 1981, Digan reported a healing while praying at the tomb of Faustina. Digan suffered from Lymphedema, a disease which causes signifcant swelling due to fluid retention, for decades. She had undergone 10 operations, including a leg amputation. Digan reported that while praying at Faustina’s tomb, she heard a voice saying “Ask for my help and I will help you”, and her constant pain stopped. After two days, Digan reported that her shoe became too large for because her body stopped undue liquid retention. Upon her return to the United States, five Boston physicians stated that she was healed, with no explanation. The case was declared miraculous by the Vatican in 1992. St. Faustina was Beatified on April 18, 1993 and Canonized on April 30, 2000. Divine Mercy Sundy is celebrated the First Sunday after Easter. 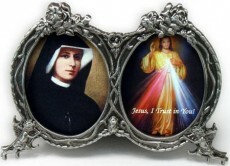 St. Faustina was a young woman that was called by God to a religious life. Her parents would not grant permission, and needed her to work to help support the family. At the age of 19, she had a vision of Jesus, telling her to go to Krakow and join a convent. She followed the call of Jesus, and became a Nun. She had many visions of Jesus, where she wrote all of it down in her Diary. She was instructed to start devotion to Divine Mercy, and to paint the image that Jesus showed her. She did as He instructed, and that devotion is still in place today, “Divine Mercy Sunday”. It includes the Chaplet of Divine Mercy and the Divine Mercy Image. She eventually became ill with teburculosis and passed away at the age of 33. She was canonized by Blessed John Paul II, in 2000. She is truly a saint for our times, and of our times, passing in 1938. She is one of the most venerated saints of our Church.